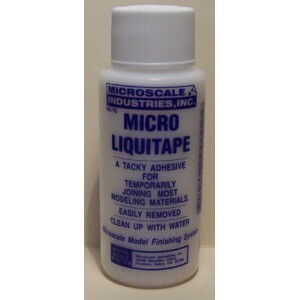 Micro Liquidtape is a liquid adhesive that when applied to one side of a part and allowed to dry, can be pressed onto another clean part where it will stick firmly enough for display model. 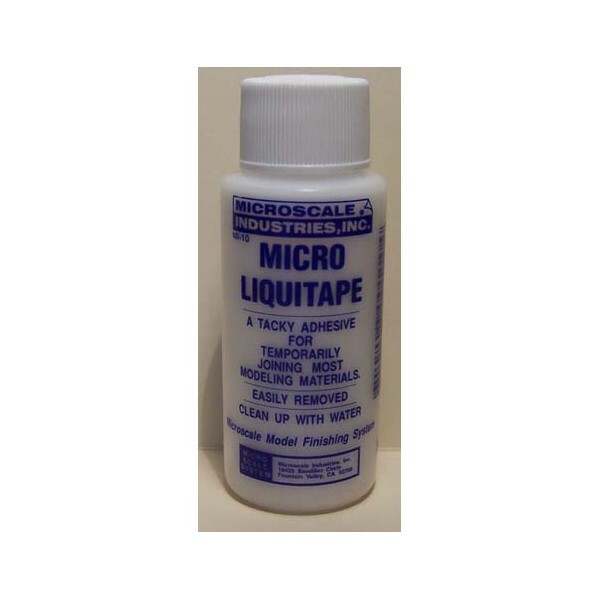 Micro Liquidtape is a liquid adhesive that when applied to one side of a part and allowed to dry, can be pressed onto another clean part where it will stick firmly enough for display model. and you can take it apart again and again as long as they stay clean. Even then, another coat will renew it. Say you would like to do a complete interior on a model, but when the model is finished you could not see it. If the top or some likely part is separate, you could use Micro Liquidtape as the final assembly and retain the ability to remove it at any time, revealing your detailed interior. There is another important use of this product, and that is in basic model construction such as “scratch building” where you are shaping a part from a pattern which you want to remove after forming. When you get to this advanced form of modelling you will know when you need it. Micro Liquitape is also a water clean up formula, as long as you do it before it has dried.